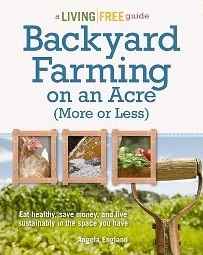 While some have mentioned that this book may not be as practical for those with an acre (or less), I have to disagree. I had previously read the USDA's "Living on an Acre" and was disappointed with the lack of actionable content. It had dozens of ideas for using land, but little guidance on actually getting started. (And practically nothing on keeping it going, building better, etc.) Ms. England's book, however, has some excellent examples of starting small, and doing more as you get more. It also has so much more 'common sense' advice than I had expected. An example would be her take on raising baby goats and sheep: If you aren't the kind that feels like getting up in the middle of the night and bottle feeding a screeching, impatient baby (with the expectation that you still have to get up and go to work, find a sitter for the thing during the day, etc.) then raising these animals likely isn't for you. Most books sugar-coat these aspects of rural living, and I love that she spells out the commitment for various activities BEFORE you invest time and money in them. Perhaps the best aspect of this book is the expertise. Ms. England speaks as one who was ACTUALLY done these farming activities. She constantly shares what has worked for her personally, and -- if she can -- she will not hesitate to share homemade, quality shortcuts that save time and money over some of the more commercial and expensive solutions presented in some of the homestead magazines I've read. If you can put it together with scrap wood, she won't tell you to buy it new from the store for hundreds of dollars.